(1) Firstly after sticking my finger in through the hole as far as I could, I clearly felt a rim on the inside. I figured that there was no way the potter that made this piece could produce such a rim unless the granary was made in two pieces. 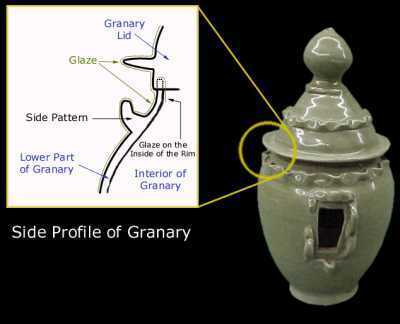 (2) Second, after shining a bright light into the hole and holding the piece at an angle, I could clearly see that the inside of the rim was glazed (as illustrated in the diagram) much like the inside rim of many jars have excess glaze that trickles down the inside of the jar. So...this granary has a lid! So why is the lid sealed? And it was not sealed buy any glue at all. The glaze covers the whole granary except the bottom rim. The glaze also covers over the joint where the granary lid meets the granary bottom. At first I thought it was a recent repair job and that there was damage to the piece where after repairs it was re-glazed. After close examination, the only damage I saw was the broken off pattern to the left of the hole in the side of the granary. The integrety of the piece seems intact. To further this conclusion was the fact that the crackles on the glaze went through the area between the joints of the lid and the granary bottom. 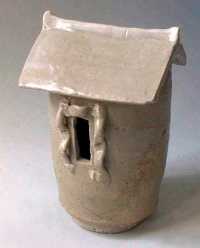 Some longer glaze crackles ran from the middle of the lid to the upper part of the lower granary piece. I believe that these crackles were made long ago as they had a slight rusty brown tint to them from being buried for a long time although the clay is a light grey color. So...why would this granary have it's lid sealed after it was made, had the glaze sprayed/painted on, then fired with its lid on. An act that would surely fuse together both pieces? Would there be a reason for this? I know it was common practice for pieces to be buried with the dead. Funery Urns often have lids and valuables were often placed inside. Could this granary be used as a funery urn instead so it's lid was sealed to keep the valuable inside? If so, why then would it have such a large hole cut into the side before it was fired. On a side note...why do granaries from the Han to Song Dynasties always have a hole on it's side. 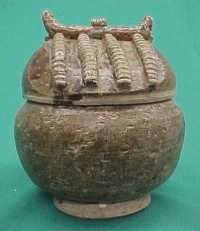 Many Sleeve jars from the Han to Tang dynasties have them too. The vary in size from large (like this piece) to very small in some Han jars located at the bottom. These granaries/jars already have an opening at their top so what's the purpose of this little hole on the side? Are these granaries really made to be used? If I go back in time would I find such granaries in kitchens used to store rice and other grains? Or are they made to represent real, larger granaries and to be buried with the dead so the dead will have lot's of food in the after life? I know I'm throwing a whole lot of endless question at you but any answer is much appreciates! Thanks again. Thank you for your interesting question. The light I can shed on this piece is limited since there is not much written about these pieces. First of all, the reason the lid is stuck is most probably that in this case it did not matter if the lid was possibly to open or not. The reason it anyway is made as a "lid" might be because this was the most practical way to assemble the piece. Due to the specialization of kiln works it is not impossibly that one warm morning in the south of China one thousand years ago, nobody bothered to tell this potter it did not matter if the lid could be opened or not. The glazing of lid and body together could of course also be an accident. On this we will know more when we find one more similar piece with or without a lid that is possibly to open. Quite similar "granaries" - with a square roof lid permanently stuck to the body - are known. Picture enclosed. Through the history texts we know that one thing the new Mongolian dynasty did when they had conquered the Southern Song dynasty was to order granaries to be built to get the farming back in order. If this really made a difference this could of course have initiated an interest in making ceramic replicas, but somehow the dates does not make sense since models of "granaries" with Jingbai glaze are well known and from a date I don't think anybody have questioned should be Song. They are clearly models of at least some kind of a shed, with roofs acting as a loose lid. I have enclosed a picture of one of these. You are also bringing up the question of the possibly use for this piece. Obviously this example was intended as a funerary gift but if they had any counterparts in ordinary life I don't know. 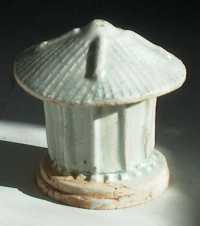 As a comparison I could possibly add is that in Tibetan Buddhism there are small "altar houses" with a similar little square hole in, used in daily life more as "shrines" to put religious relics inside - a bone from a wise man, a curl of somebody's hair or a piece of important writing. A similar use for these "granaries" with square holes in the side could be considered. I enclose a picture of another granary of alleged Tang date - I don't know since I have no references whatsoever on that piece, but similar shapes are known from the short-lived Qin dynasty. Finally to make things even worse - or more interesting depending on how you look at it - there are even jars known from Neolithic times, with square holes in the side - thought to have been put there to let the spirit of the dead out.